Preheat oven to 325 degrees F (160 C). Lightly grease and flour baking pan* (See notes below about pan sizes), shaking off excess flour from pan. Cream butter and add sugar, beating until foamy. Add egg-yolks (beaten lightly); then the grated lemon rind. Beat mixture for 15 minutes. Fold in the stiffly beaten egg-whites, then add the flour. Bake as a loaf in a slow oven at 325 degrees F (160 C) for 1-1/4 hours (75 minutes). This is a large, rich cake which will keep fresh for a long time if wrapped in wax paper and kept closely covered. Since this pound cake recipe makes quite a large cake, use 1 large loaf pan, at least 10 x 5 x 3-inch, or 2 smaller loaf pans that are at least 8 x 4 x 2-1/2-inch or 9 x 5 x 2-1/2-inches high. There are also very large 13-cup loaf pans that measure 13.75 long x 3.75 high x 4.5 inches wide that would work well to bake this pound cake in. You may also use a 10 to 12 cup or 10 inch bundt or tube pan. 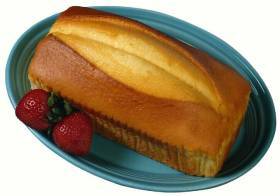 If desired, you may make this pound cake in a 9 x 13 x 2-inch rectangular baking pan. If using a rectangular pan, grease bottom of pan, and line with parchment paper, and grease parchment paper also. This will make the cake much easier to remove when done. You can find a large variety of loaf pans at Cooking.com. They carry several brands, sizes and styles. Click on their banner on this website to bring you to their bakeware section. Makes 1 or 2 loaf cakes, or 1 (10-inch) bundt or tube cake, or 1 (9 x 13-inch) rectangular cake. Source: Recipe adapted from Prudence Penny Cookbook, 1939. Great recipe except for one minor detail the flour needs to have salt added so that its not bland. Please remember that the butter used in this original recipe had tons of salt to help preserve it. I also used this recipe using self rising flour double sifted and it came out great. It is very delicious. I loved it. It's much better than the simple one. I used only half the quantity of the ingredients but the outcome was unexpectedly good. This is just the right recipe i've been searching all over for thanks. I was looking for a pound cake recipe like this for a long time. Thanks. it was the worst thing i've ever tasted in my life. it deserves less than a one. less than a 0.5! I have done this recipe in a commercial setting using 20 lb. quantities and it is a classic standard. The method I learned for it was a bit unorthodox, but works well: I cream the butter and the flour together, dissolve the sugar and eggs by beating them and then add the sugar/eggs to the flour/butter and mix thoroughly and completely to ensure the egg/sugar is combined well. Batter should be smooth. We used salted butter, so no need for salt the flavouring (Canadian spelling). Thanks very much. I've been looking a long time for a recipe for pound cake. I tried it, just delicious. I HAVE TRIED THIS RECIPE SO MANY TIMES AND IT COMES OUT PERFECT EVERY SINGLE TIME. I HAVE MADE IT ABOUT 10 TIMES AND I'M ONLY 12!!!! I LOVE THIS RECIPE SO MUCH, THANK YOU DIANA!!! I will add the necessary salt and baking powder/soda needed, or use self-rising flour. Thank you so much. How long to bake in a 9 by 13 by 2 inch pan? Will this pan hold all the batter?